Saba University | College is……..
After 3.5 years of undergraduate work, my next journey will be to Saba University School of Medicine. School starts in less than a month! Medical School at Saba will be very different from undergrad. At Chapman, I had many luxuries such as internet, iPhone, and online shopping. Since Saba is a small island owned by the Netherlands, many of the luxuries I had in California will be much more difficult. Starting my housing paperwork, I noticed that the fastest internet speed in the dorms is 512 kbs!! To put that in perspective that is about 1/60th of what I’m used to. Also grocery stores have to import most of their food from other islands (I’m hoping the seafood will still be there!) Also hitchhiking is very common to get around the island. I am told that Saba has very low/ no crime and less distractions, which makes it the ideal place for my studies. 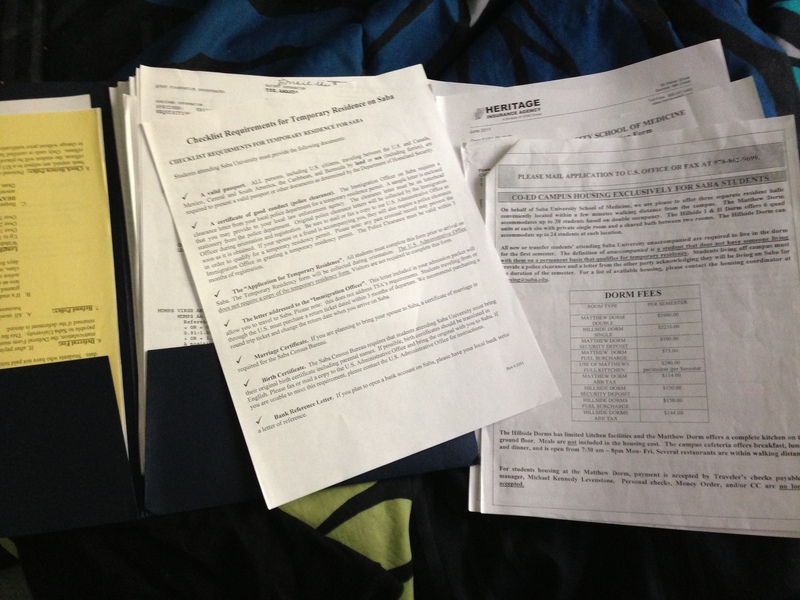 In the meantime, I have been working on so much paperwork to study on the island! I thought applications were difficult…. NOPE there’s more! Immigration to Saba requires, as expected, a police clearance letter, immunizations, banking letters and passports/IDs. I wish I had started much earlier, but I was at Chapman finishing my degree. Unfortunately, even though I had all the required immunizations since birth, some of the tests still came out negative. Luckily I’ve been given an extension on my immunizations. There’s also school supplies and flights and ferries (Saba doesn’t have an international airport so all students have to take the ferry/plane from St. Maarten). For this trip, I wasn’t brave enough to take the Winair flight. Saba has one of the most difficult landing sites for aircrafts since the whole mountain is a giant volcano. So much work still to be done before school starts! This entry was posted in Uncategorized and tagged caribbean, Medical school, Saba, susom. Bookmark the permalink. Mmmh I must admit, never heard about Saba until today and your description of it makes me want to go now now! Goodluck with all the paperworks and formalities, sounds like it’s going to be a great great life experience! Thank you for your comment Dyna :)! I hope it’s great too!! I came upon your blog on google and check out a few of your early articles. If you have a chance check out my site electronic dance music. Helpful information. Lucky me I discovered your web site unintentionally, and I’m shocked why this coincidence didn’t came about earlier! I do not even understand how I ended up here, however I thought this submit used to be good. I do not realize who you are but definitely you’re going to a well-known blogger if you happen to are not already 😉 Cheers!